Difficulty: Pink - Saturday is the more challenging with a long but rarely steep climb up from Newport over the Brecon Beacons. Sunday is much flatter and finishes downhill for the last 7 miles. The surface is a mix of gravel towpaths, tarmac paths, some short unsurfaced sections along the canal and very occasional but short rides on quiet roads. 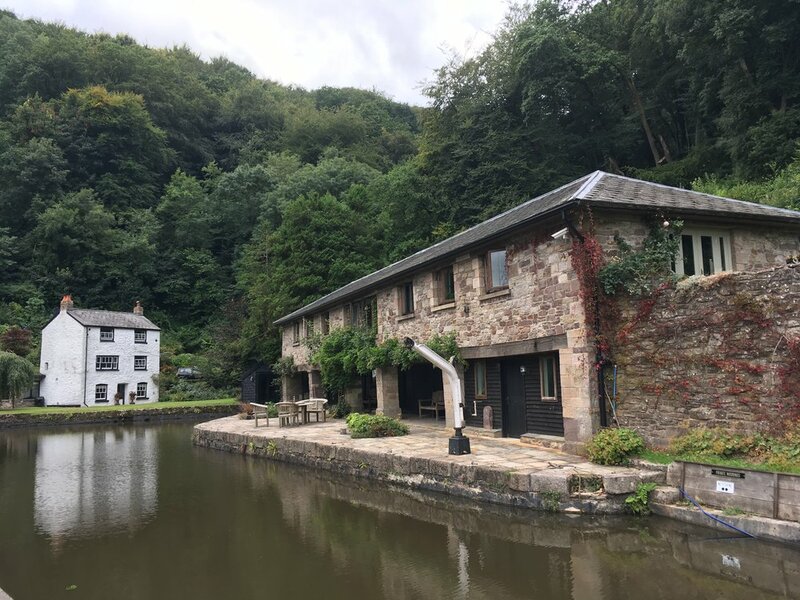 Experience the unbelievable beauty of the Welsh valleys and Brecon Beacons, combining an incredible natural landscape with a fascinating industrial heritage, whilst able to relax completely as our route takes you from place to place on an incredible off-road network of paths including the Taff Trail and Monmouth Canal towpath. We’ll set out from Shaftesbury Park, just a short pedal from Newport Station. A 50-metre detour allows you to get a glimpse of the once grand Newport Castle, now in a sad state of repair clinging on to the river edge wedged between road and railway bridges. We’re soon out of the houses and joining a disused section of the Monmouth canal. From here it’s a very gradual ascent along the peaceful towpath, the only challenge provided by the old humpback bridges built to allow barges underneath and the metal gates that block motorized vehicles from getting on the path. We’re in no rush though, in fact, we have the whole day to unwind and enjoy the bright blues and oranges of kingfishers, the bright green algae floating on the still water and the sunshine yellow lilies that rest on top. After around 8 miles, we cross onto a disused railway, originally built to carry iron ore from the Tredegar iron works to the canal and onwards to the docks at Newport. Nowadays it’s a beautiful Sustrans route that surrounded by rivers and forested hills. The path continues with relics of its industrial heritage at every turn before we pass through small valleys towns and run alongside the Taff river for the final section of the morning into Merthyr Tydfil, where lunch awaits at the impressive Cyfartha Castle. After lunch the path follows another old railway line with the ghostly ruins of Cyfartha Iron Works alongside, the sheer size of them outlining what a different place this once was. The line continues until we reach Pontiscill Reservoir and climb onto the Brecon Beacons. This is your biggest challenge of the day but never too steep and well worth it to escape from industrial history into wild nature. Pass through forests then descend a gravel path to another reservoir, the high peaks of the Brecons including the mighty Pen y Fan, the highest point in southern Britain, off to your left. After 7 beautiful miles of descending we rejoin the canal system for the final roll into Brecon. Begin the day by joining the canal outside of Brecon’s modern-day theatre and what follows is one of the most peaceful days of riding you can ever imagine, only briefly leaving the canal-side once or twice. Enjoy as we pass under and over drawbridges and hump-back bridges aplenty, just remember to duck and ring your bell as many dip lower than expected and involve blind corners. You’ll need to go slow but with these views, why would you rush? Pass the bustling Welsh towns of Crickhowell and Abergavenny without ever worrying about traffic, instead you can while away the time saying hello to dog-walkers and canal boat owners, spotting Kingfisher as they zoom along or admiring the views up through the forests to the hills of the Brecon Beacons above. Another day rich in industrial heritage, we’ll stop for lunch at Goytre Wharf, another relic of Wales’ rich industrial heritage. Here 200 years ago, massive coal-burning kilns were used to extract lime which was then sold for use in industry and agriculture. From here it’s downhill pretty much all the way, passing numerous impressive locks built to transport the canal boats down into Newport. We’ll be staying in Brecon overnight on the Saturday between the two rides. We do not provide accommodation for anyone joining us for both events, so you have the flexibility to choose a location and budget best suited to your requirements. We will however book a table for an evening meal in a local pub or restaurant on the Saturday night, so you can join us to socialise with fellow riders if you wish. This is not included in the event price but we’ll let you know the venue, meal options and price nearer the time and you can join us if you wish. We do not charge a fee for organising this, only the price of the meal.